The Old Wood Colonial Desk is built in the style of an Old World Spanish desk. Made from solid old and reclaimed wood, this desk features a smooth top and square raised panels along the front and sides, all allowing for the natural stretches and movements of the wood to be seen. The back side features four large drawers, accented with hand forged iron hardware for a great deal of storage space. 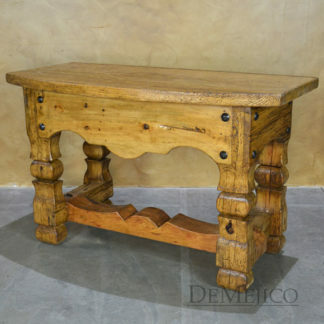 Add the Old Wood Colonial Desk to any Spanish style home or office space.